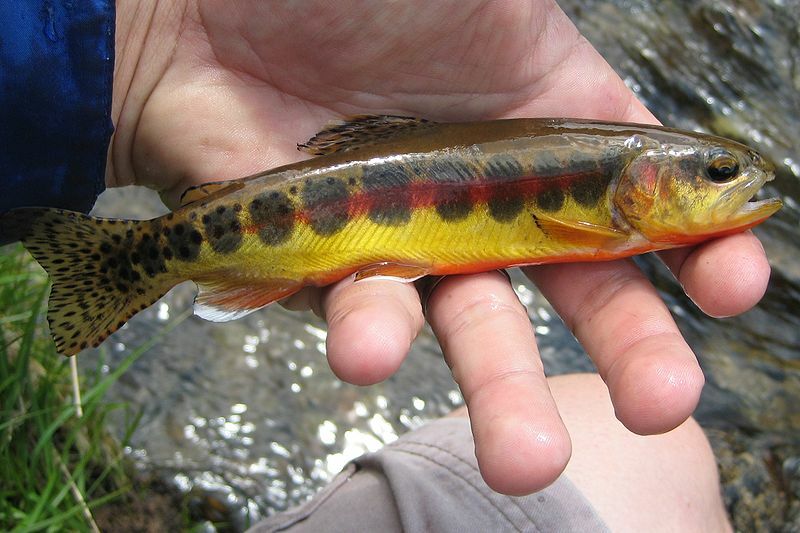 One of the most splendid meals I’ve ever eaten was California golden trout (Oncorhynchus mykiss,) roasted over a campfire, and a cobbler of pink Sierra currants (Ribes nevadense.) Every summer for about ten years, I took young people from my church backpacking in the High Sierra along the John Muir Trail. We packed freeze-dried food which we divvied up amongst the backpackers. An over-privileged student wearied by his forty pound pack dumped his share of the food over the side of the trail. We were one day short of food. While protecting the offender from the wrath of the others, I began scouting the forest for forage. Remembering my military survival training, I found watercress (Nasturtium officinale) and edible grubs and insects. Fast-food addicts, they all said, “Ugh! Yuk!” Just below a sub-alpine lake, I spied a thicket of pink Sierra currants with its tasty blue-black berries. Along with a couple of non-fishing volunteers, the offender was sent off into the thicket to pick the berries. Those with fishing gear went along with me to the lake and stream to fish for our dinner. We soon had our limit. I solicited all the graham crackers from the group, and we made a cobbler with the berries. We ran pliable branches from creek-side bushes through the trout from mouth to tail, roasted them over the fire, eating them like sweet corn on the cob. All of which brings us to our yards, not in the High Sierra, but on the Colorado Plateau, especially berries for wildlife and birds. Pink Sierra currants do quite well in Flagstaff. A California native, it’s found in forests from 3,000 to 10,000 feet. Its berries are sweet, tart, and edible. It thrives in climate akin to Flagstaff’s. It survives both drought and flooding and prefers the company of pine trees. 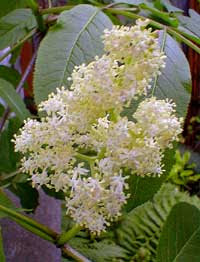 A deciduous shrub about three to five feet high, it flowers from April through July with white and pink blooms. In the summer, its fruits hanging in six inch cascades are favored by both birds and human beings. Its weeping branches are without thorns, making it safe for children. If unavailable in our local commercial nurseries, it can be ordered online at http://www.laspilitas.com. 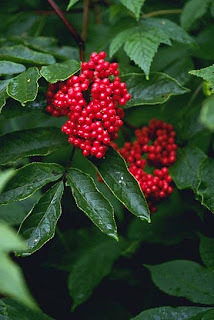 Next in our list of food for birds is the red elderberry (Sambucus racemosa.) However, its berries and plant are slightly toxic to human beings, producing a derivative of cyanide. For this reason, children should be kept from playing with the plant, flowers, and berries. However, with careful preparation a delightful cordial and jelly may be made from the berries. It can grow into either a clump several feet high or a small tree. It favors well-composted soil and regular watering. The green leaves are either oval or oblong. 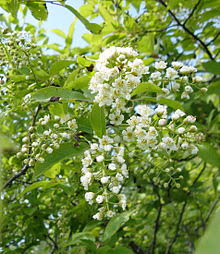 In the late spring its cream-colored flowers bloom in large clusters followed by small black, blue-black, or red berries. Both the flowers and the bush itself are slightly unpleasant to the nose but charming to the eye, especially when in bloom and fruiting. More importantly, it is attractive to birds and particularly winsome to doves. The plant including its seeds is toxic to humans and also to horses and other animals with segmented stomachs. 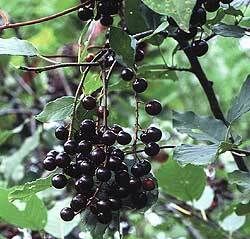 With the exception of the flesh of the berries it also produces a form of cyanide when eaten. Along with the red elderberry mentioned above, it makes an excellent hedge from twelve to twenty feet high, bringing privacy to the garden. Shade tolerant, it needs full sun to produce berries good for food. Happily for Flagstaff, it is moderately drought tolerant. The berries have been a major food for many Native American tribes and were often used in pemmican. Also, they can be used for wine and jellies; however, mostly its fun watching the birds eating the berries. Dana Prom Smith edits GARDENING ETCETERA for the Arizona Daily Sun, and can be emailed at stpauls@npgcable.com and blogs at http://highcountrygardener.blogspot.com.